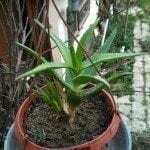 I have a very large aloe plant, it needed to be replanted so I watered it then I replanted it in wet soil. Will my plant die or should I remove it again and let it dry out..? I would not disturb it anymore. Just make sure you let it dry out very thoroughly before watering again. They are very drought tolerant, and will enjoy being dry for a little while between watering. As a side note... Your aloe is flowering! This is a rare sight, and something very interesting to see.